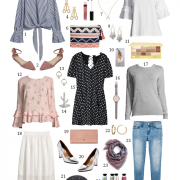 Though a LWD can easily stand on it’s own without much need for accessorizing (on hot days, I’ve worn this one with my favorite fedora & flat sandals), sometimes it’s nice to balance out a feminine style with more masculine pieces. I scored this camo jacket on major clearance last week and just love the tough edge it gives to girly items in my closet. Add some layered necklaces + lace-up heels and it’s a fun way to modernize a classic embroidered dress. OoOo….LOVE that LWD! It's been WAY too hot to wear my camo jacket. But it's one of my faves! Such a classic look! Loving that necklace and heels..
Beautiful outfit! Perfect shoes and necklace! 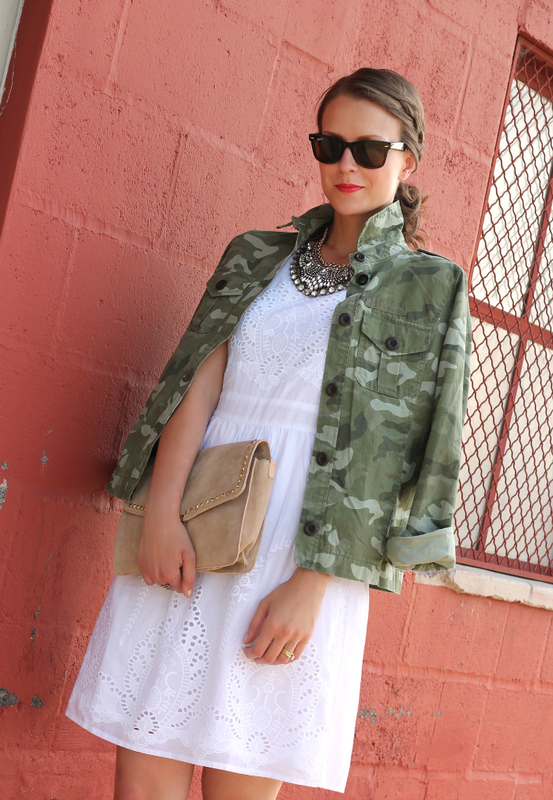 I love that camo jacket over your dress. Very neat. You found the jacket! Love how you paired with a delicate LWD ~ adds the perfect amount of edge. Those statement necklaces look fabulous also. 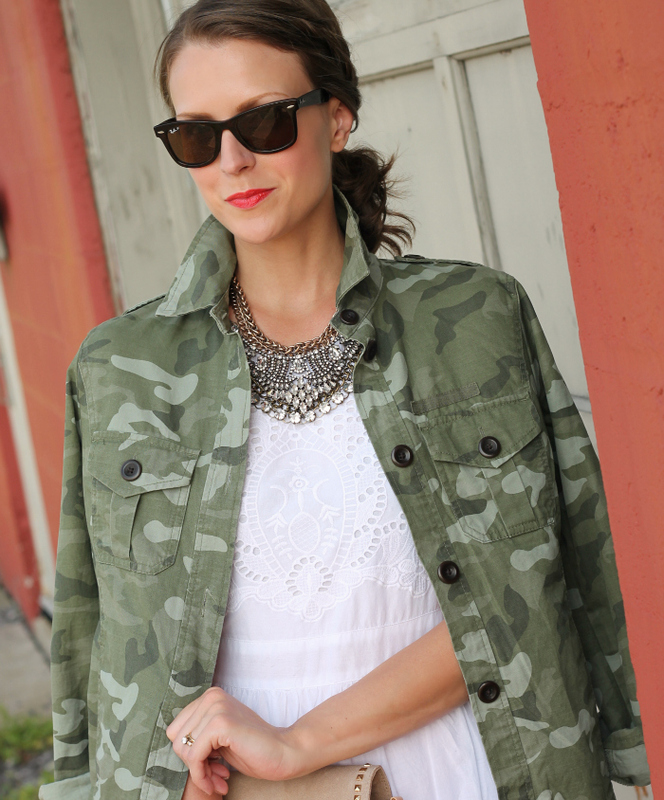 Really love the edge the camo jacket gives to this look…so fun! Love the necklaces and how they're made to look like one, Kim. The unexpected combinations here are brilliant and work wonderfully. Thanks for the inspiration!! This dress is so pretty! I'm absolutely loving those heels too. Looove that necklace you're rocking!! OH!! I love, love those shoes. You really know how to put some outfits together. I need to lose a little weight so i can play copy cat!! :) Take care, and God Bless u and yours. 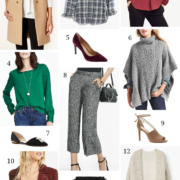 DYING for that Gap jacket!! Perfection!! obviously you know i want to steal this outfit. every inch of it! beautiful dress and great styling! 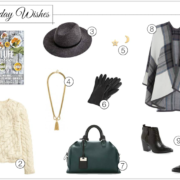 just became obsessed with the dorothy perkins website! already made my first purchase, ha. I love everything about this outfit! You always think of the most creative combinations! love love this look! The camo with the lace and paired with those shoes! SO cute!! 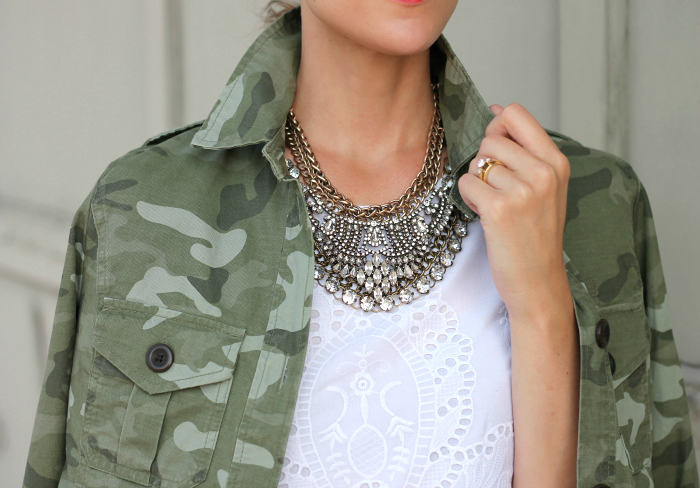 How wonderful is that you look elegant even with a camo jacket?! Well done girl! I knew you could pull of the camo with ease! The whole thing looks amazing!! I am dying for this heels!! So fun!! Have a great weekend!! This outfit is just beautiful! The embroidered dress goes so well with the camp print for an unelected combo! Don't you just love how a camo jacket transforms any look? Such a sweet, but oh so cool ensemble Kim! Love it! Pretty much agree with everyone here…this looks is so perfect in how unexpected it is! I actually have a similar white eyelet dress that I've been wondering what to do with it…so this gives me a few ideas. Thanks Kimberly! This is such a great mix of masculine and feminine! The camo touch is perfect!